Massachusetts is taking aggressive steps toward cleaning electrical grid and in doing so is joining a select group of regions around the world. Of course Germany and California get all the headlines, but also deserving are Portugal, Scotland, Hawaii, Iceland, Costa Rica, Uruguay throwing down part of $285B worth in 2015. There are also the global giants China and India building massive amounts of infrastructure. 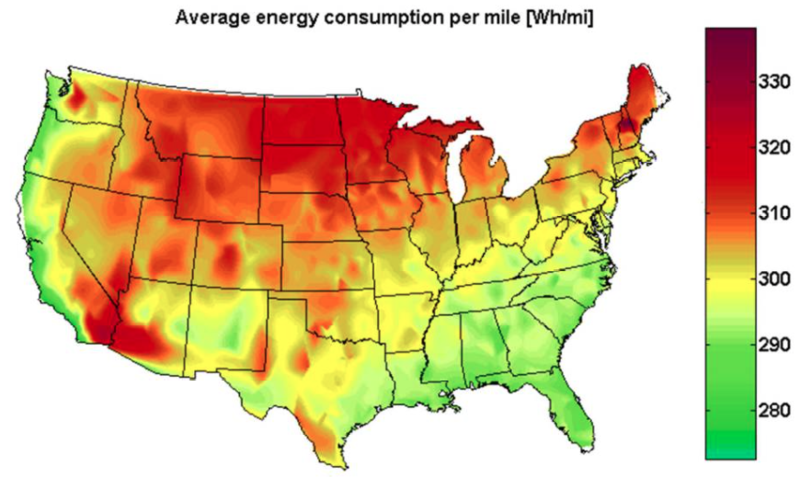 In a new paper in the ACS journal Environmental Science & Technology, Tugce Yuksel and Jeremy Michalek at Carnegie Mellon University have shown the average energy usage per mile of electric cars across the US. You’ll note that warm but temperate climates like the California Coast and the Deep South especially Florida fare the best. Very hot desert areas like Arizona don’t do well because of the energy required to cool off bith the batteries and cabin. The North does poorly because batteries lose power as weather gets cooler. 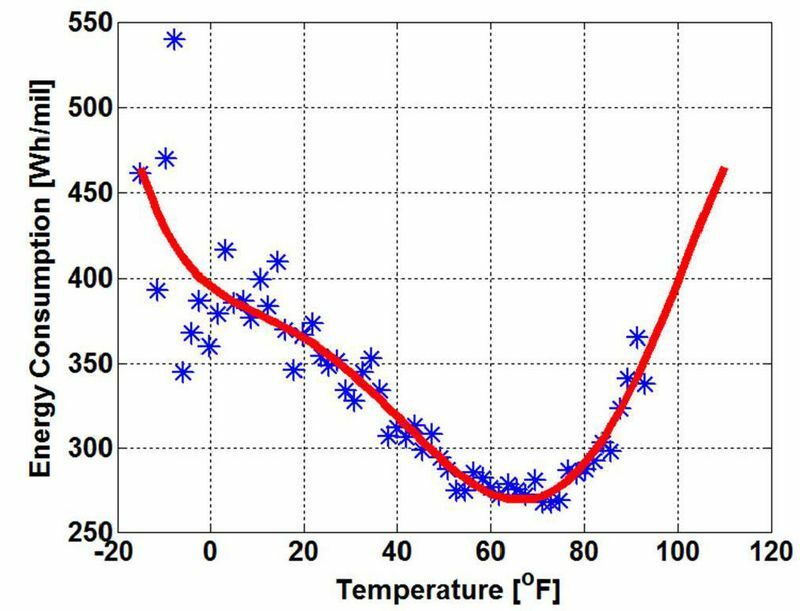 Below, a Nissan Leaf efficiency is graphed at different temperatures which illustrates this disparity more clearly. The optimum range for operation is between 45 and 82 degrees where the 300W/mile threshold is beaten. 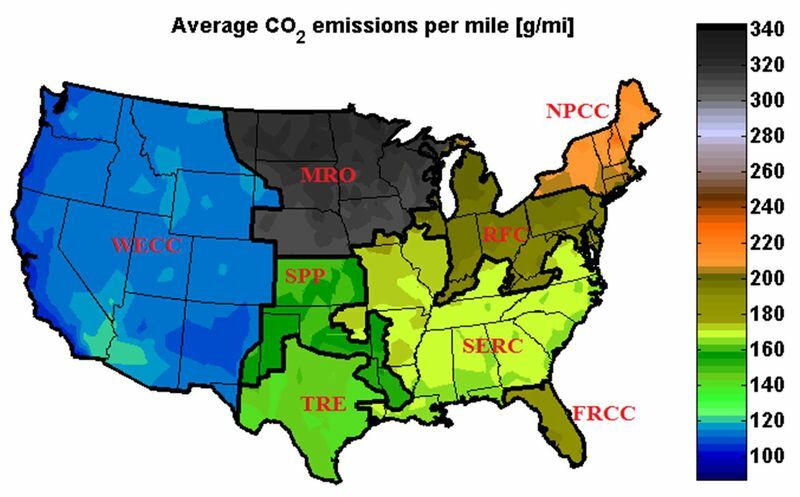 This all translates to CO2 emissions obviously and with the West making their energy much cleaner, they produce about 1/3rd the CO2 emissions as the north Midwest which is basically one big coal plant. In fact, that area’s energy is so CO2 intensive that running an electric car there (assuming you don’t have your own solar/wind) rivals the CO2 emissions of a fuel efficient car like a Prius. The big takeaway is that moving to electric cars isnt enough. The grid also needs to move to cleaner power like wind and solar.